Black beans are a staple in many Central and South American countries. In Guatemala, they may be stuffed in a thick corn tortilla (pupusa), while Costa Ricans enjoy a dish of refried black beans, rice, and onions called gallo pinto. The Brazilian national dish, fejoiada (pronounced "feyj wah dah"), also features black beans, and while it traditionally includes sausage and other meat, you can find recipes for vegetarian versions online. Black beans are also popular in the United States, thanks in part to the proliferation of fast-casual Mexican restaurants that feature black beans as a side dish or tucked into burritos, tacos, and other specialties. Here's a simple recipe that you can easily adapt to what you happen to have on hand. 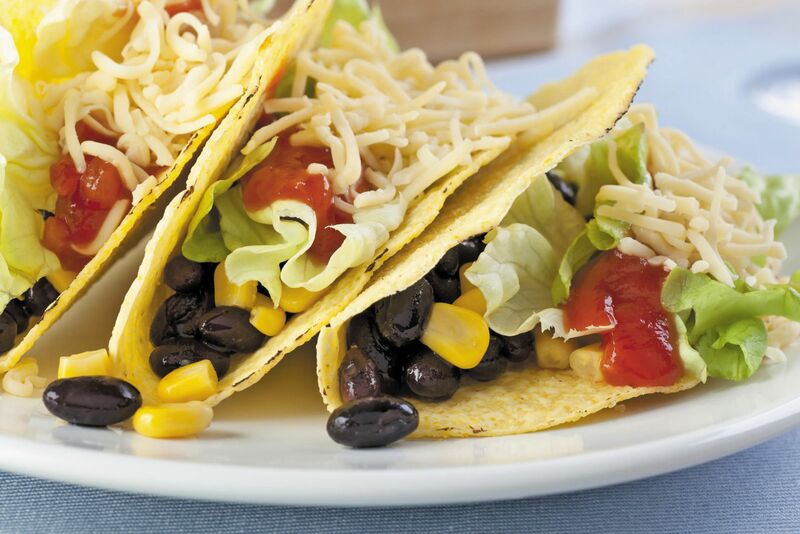 Suggested toppings: Chopped tomatoes, corn kernels, sliced bell peppers, shredded lettuce or cabbage, grated cheese, plain yogurt, salsa, diced avocado, chopped onion, chopped cilantro. Wrap tortillas in a clean towel and microwave for 30 seconds. Set out all ingredients to let everyone make their own tacos.